– by Lynne C. Lancaster and David Stillman. Collaboratively researched by a Baby Boomer, a Gen X-er and a Millennial the book offers a deeper understanding of the perspectives of Millennials. The research and references to other works/research provides insights to stimulate thinking about the different generations. 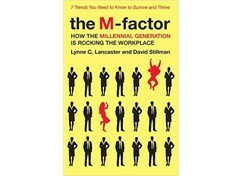 While there are certainly generalizations about the generations, the authors share reminders how the workforce is shaped by each generation, who all bring valuable contributions. Not surprisingly, the biggest reminder is to seek to get to know people as individuals rather than lumping people together into a category.